Saffronart: "We don't see it as competition- we view it as all of us building the Indian art market together"
Highlight of the catalogue: Tyeb Mehta's Kali, 1989. One of three standing Kali figures he produced. Courtesy Saffronart. CLOVE What is the significance of this summer’s online auction, the 200th auction for Saffronart? ABHA HOUSEGO Our summer online auction (13-14 June) marks an important milestone, 18 years of art sales in India and abroad. To celebrate, we’re presenting 150 major modern and contemporary works by artists spanning from the pre-independence period to the present day, taking in more than 100 years of art history. Each work epitomises the achievements of these artists, and was chosen bearing in mind its historical contribution to Indian art. We introduced live auctions in 2013, but we haven't moved away from our roots as an online auction house. With this summer’s auction, we’ve come back to where we started, with one of the best catalogues we’ve produced. CLOVE How have online auctions been a successful strategy for Saffronart, and for the Indian market in particular? How do you perceive competition from rival auction houses? AH When Saffronart began in 2000, we recognised that we needed to reach a globally dispersed audience: the Indian diaspora. The internet was a great instrument for this, particularly as this group comprises many young, tech-savvy entrepreneurs. So we went online, but followed a “click and mortar” approach – physical spaces, where one can go view the artwork you chose [at galleries in New York, Delhi, Mumbai, and London] and then bid online. A great attribute of our website is that it contains so much information about the pieces [i.e. additional charges, comparables, different views for installations or sculptures], which helps the bidder make a more informed decision. Online has been key to our business and the Indian art market is very mature as we grew it online. In terms of the competition, we absolutely love having more auctions in India, such as Sotheby’s coming to Mumbai in December, as well as the many local auctions taking place, because it proves to clients that there is a strong market. We don’t see it as competition – we view it as all of us building the Indian art market together. CLOVE What are some highlights from this auction? AH The process started quite early on. Dinesh Vazirani [CEO and co-founder] and the team wanted to put together a collection that surveys the best of contemporary and modern art and I believe we have done that. Tyeb Mehta’s rare and iconic Kali (1989), one of only three standing figures, leads the auction at $3-4m (INR 19.5-26 crores). Saffronart first revealed the cover lot on 24 April, attracting headlines that drew attention to the artist’s enduring popularity among art connoisseurs. A 1965 Untitled canvas by V S Gaitonde, estimated at $800,000-1.2m (INR 5.2-7.8 crores), is among the top lots, and is one of his most important works from this decade. Raja Ravi Varma’s Untitled (Shiva) is a rare representation of Shiva as Dakshinamurthy. It was painted in 1903 towards the end of the artist’s career, and is estimated as $461,540-769,235 (INR 3-5 crores). A large, ochre canvas by Manjit Bawa is estimated at $500,000-700,000 (INR 3.25-4.55 cores). S H Raza’s Paysage Provencal - I (Cagnes), 1951, stands out for his mastery over composition, and is estimated as $200,000-300,000 (INR 1.3-1.95 crores). Other notable modernists include Amrita Sher-Gil, Anjolie Ela Menon, Ram Kumar, N S Bendre, F N Souza, Bhupen Khakhar and Arpita Singh. S H Raza's Paysage Provencal - I (Cagnes), 1951. Courtesy Saffronart. A strong sculpture section includes works by Himmat Shah, Sankho Chaudhuri, Prodosh Dasgupta, Meera Mukherjee, S Dhanapal, and Piraji Sagara, who was represented at Art Dubai earlier this March. These artists are renowned for their bold experimentation and sensitive approach to the process of creating sculptures. Apart from these leading names, the auction also draws attention to less well-known artists whose work left a mark on the modern Indian art scene. CLOVE Can you talk about lots 123-150, which are contemporary works by artists such as Subodh Gupta? AH We’re one of the few auction houses who supports the contemporary market because while modern art has continued to grow in price, contemporary works have struggled since the 2009 depression. But we recognise that contemporary artists are the next generation so we support them, and it also reaches out to a younger audience. This year we’ve got a very strong contemporary section, which includes 23 works by the foremost practitioners in the field. 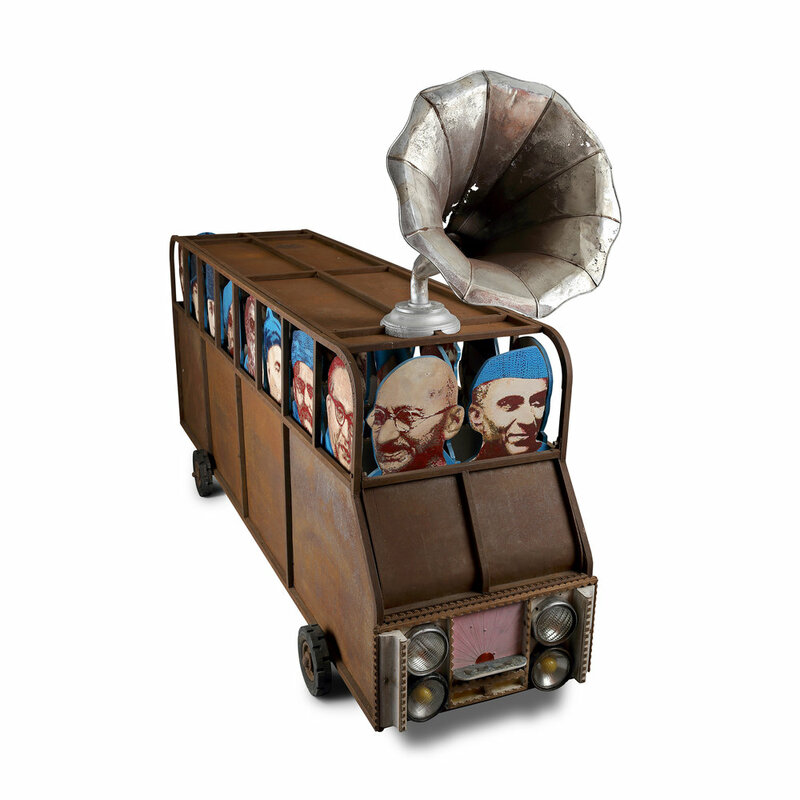 Nataraj Sharma's Freedom Bus (2001-04). Courtesy Saffronart. The highlight of this section is Hungry God (2005-06), a larger installation of stainless steel vessels by Subodh Gupta – his first solo retrospective in France, Adda / Rendez-vous was unveiled in April 2018 at Monnaie de Paris, reinforcing his strong international presence. Another highlight from this section is Nataraj Sharma’s 2001-04 Freedom Bus. Jagannath Panda’s 2011-13 Migrant Anywhere, Anytime-III really stood out to me. There are also works by Anju Dodiya, Justin Ponmany, Thukral and Tagra, N S Harsha, Alwar Balasubramaniam, Dhruvi Acharya and Rina Banerjee.